Reynolds, Gainsborough, Titian, Ingres. All describe European portrait painters of history and big names in the art world. When asked to think about art or chose an artist to study, many of the same images are the first to surface and dominate our understandings of what constitutes art. But what happens when the tradition of European portraiture is complicated and challenged? When someone engages the visual rhetoric of prestige and glorification in the form of the urban black male? When issues of race, power, and political representation are brought to the forefront of art-historical discourse? Kehinde Wiley was born in 1977 in Los Angeles, California as a twin brother to an African-American mother and Nigerian father. He was raised in the absence of a father and it was his mother that supported his passion for art and enrolled him in classes. He earned his BFA from the San Francisco Art Institute in 1999 and his MFA from Yale University in 2001. However, while many aspects shape Wiley’s identity - and as a result, his art - much early criticism has failed to explore the wider implications of Wiley’s work. From a young age, Wiley recognized that the history of western painting excluded people of African descent. A personal favorite of his is Kerry James Marshall’s grand barbershop painting in LACMA, which threw into sharp relief the absence of black images in the museum. He felt a certain fascination with being able to feel a relationship to the institution and the fact that people looked like him on some level. In incorporating the urban black-male figure into his current art, he questions the centuries-long exclusion of such figures, and affirms their presence in a society that has long discounted and undervalued them. 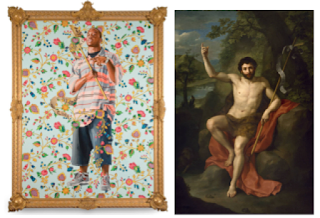 Kehinde Wiley first caught my attention with his piece St. John the Baptist II. On my first day working at the Nasher, I was walking through the Open This End collection of contemporary art when I came across Wiley’s piece. Larger than life and visually stimulating, it left standing in quiet awe as I felt the need to adequately understand and appreciate that which hung before me. Teeming with nuances and intricacies – both literal and figurative – I was drawn in by the ornate details of the flowers in the background and the juxtaposition they presented to the street clothes, cell phone, and watch. These elements also make statements about masculinity and materialism, respectively. The flowers can both serve to emasculate the figure, but also enhance his commanding presence. This piece helps to call attention to media stereotypes, and complicate the already existing understandings of a single African American stereotype. Wiley incorporates Renaissance, Baroque, and Rococo elements in his works, with a focus on the importance of portraits that signify privilege and prestige. The combined depiction of street wear and haute couture, hyper-masculinity and effeminate postures, old and new, questions and assumptions comprise a multiplicity by which Wiley challenges the status quo. Irony lies in the sense that juxtapositions serve to highlight the very different natures of the two realms, while the interchange of elements across styles and time periods show that the two are more similar than many would like to think. There lies a common preoccupation with image and wealth, with the consumerism of hip-hop conflating with the opulence of the old master painting. The desire to be recognized is also handled with an ironic touch as it is typical for Wiley’s models to remain anonymous his works to rater be named after the art source. In this sense, the male subject serves as more of a “type,” a representative of a group, than an individual identity. In Napoleon Leading the Army over the Alps, Wiley uses a familiar story from history to tell a lesser known one – one about contemporary black identity. 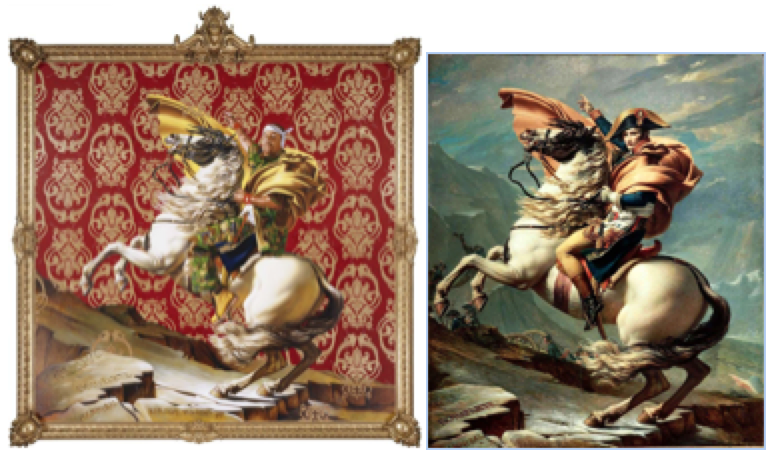 Jacques-Louis David’s painting Napoleon Bonaparte Crossing the Alps at Great St. Bernard Pass is appropriated, with Napoleon boldly recast as a black warrior, donning camouflage fatigue. The patterned wallpaper background acts to draw visual focus to the subject, as well as amplify his air of self-possession. The neglect of black subjects in history now reassigns value to the sitter, suggesting the viewer invoke images of remarkable black leaders such as Toussaint L’Ouverture and Martin Luther King Jr. Wiley seeks to address the importance of seeing presentations of black subjects in contexts of power, beauty, and confidence, as well as the dangers of disregarding their absences from institutions. He has also quite deliberately strayed from overt identity politics, characteristic of African-American artists of the previous generation, while still posing questions, challenging society’s perceptions, and embracing the dichotomies present. In this elaborate and sophisticated impersonation, a young man from Harlem, New York, stands in the place of Willem van Heythuysen, a wool merchant from Haarlem, Netherlands. With the overlap of the city name is also the replicated pose, where the subject of the painting stands exactly as that of Frans Hals’ paintings, sword and all. The exception to this impression lies in the clothes donned by the subject, replacing the attire of a member of the Calvinist bourgeoisie with that of a hip-hop lifestyle. The Sean John sportswear and Timberland boots provide a very different narrative, while the ornamental background amplifies the work’s artificiality by placing the figure in a non-space. Furthermore, the golden tendrils of the large flowers wrap around the figure’s legs, suggesting a presence that cannot be contained. Wiley’s painting sheds light on our age’s conflicted relationship to privilege, power, and the past through Hals’ portraits depicting the Golden Age of Holland. 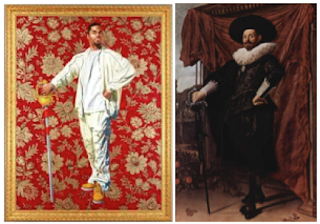 "John Ravenal | Recent Acquisitions, Kehinde Wiley's Willem Van Heythuysen." John Ravenal | Recent Acquisitions, Kehinde Wiley's Willem Van Heythuysen. N.p., 2007. Web. 04 Oct. 2015. 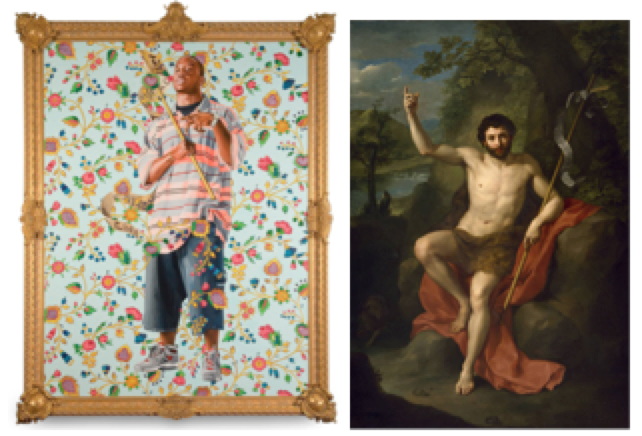 “Kehinde Wiley: A New Republic." Brooklyn Museum: Web. 04 Oct. 2015. "KEHINDE WILEY STUDIO KW STUDIO." Kehinde Wiley Studio KEHINDE WILEY Comments. Web. 04 Oct. 2015. "Kehinde Wiley." Wikipedia. Wikimedia Foundation, 2 Oct. 2015. Web. 04 Oct. 2015. "Napoleon Leading the Army over the Alps." Brooklyn Museum: Contemporary Art:. Web. 04 Oct. 2015. Tsai, Eugenie, Connie H. Choi, and Kehinde Wiley. Kehinde Wiley: A New Republic. 2015. Print. Born in March 30, 1853, in Groot-Zundert, Holland, Vincent van Gogh is one of the greatest and most influential artists in the history of art, with a record of some of the most fascinating artwork. Growing up in a religious family, van Gogh initially studied theology and did missionary work aspiring to become a pastor. But at the age of 16, he was exposed to art by working in a firm of art trading; and at the age of 27, van Gogh decided to become an artist. 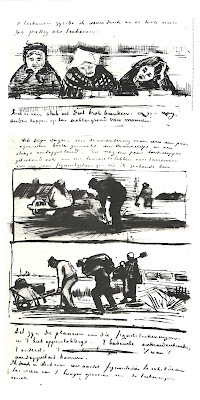 He then studied art in Belgium, and developed his artistic skills through discipline and exchanging ideas with other artists, to eventually develop his unique style. Van Gogh suffered from a mental illness that ended up in his suicide with a gunshot at the age of 37 in July 29, 1890. Van Gogh’s artworks range from portraits, to landscapes, to still life, to trees and sunflowers. They also range from somber in his early drawings to bright when van Gogh later moved to south France and met French Impressionists like Monet. I chose Van Gogh for my research for several reasons. First, I was drawn by the narratives that van Gogh tells in his art pieces and how he includes feelings and evoke strong and profound emotions. Van Gogh’s artwork is very expressive and emotional. Indeed, van Gogh clearly tells a narrative and conveys a message through his art pieces. The viewer can tell what is going on in the images. Even more, we can tell and share the feelings of the people in the drawings. Van Gogh was sensitive to the sufferings of others, and he tended to convey strong emotions, mostly sorrow, anguish, despair and torment. People in his drawings tend to seem immersed in their own worlds and lost in their thoughts. And the backgrounds usually refer to an agitated state. Then, I find that Van Gogh’s artwork is very realistic. In fact, several times, as I was going through van Gogh’s drawings and paintings, I actually felt like I was inside the actual scene or landscape that van Gogh presents. Moreover, van Gogh is an eloquent example of the significance of perseverance in overcoming the frustration that a beginner artist may face. 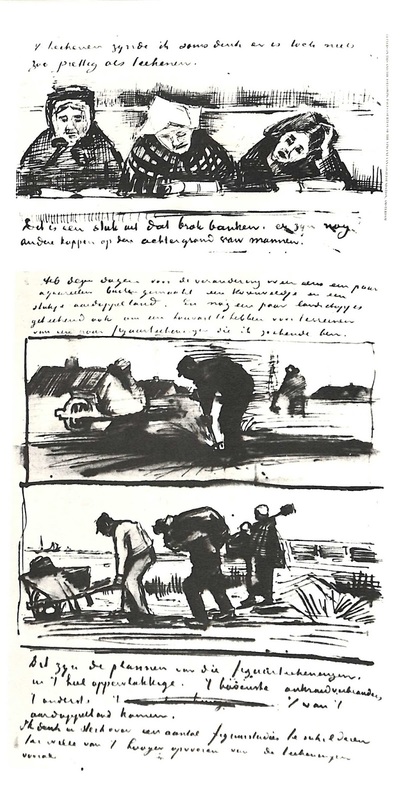 In this context, early in his career as an artist, Van Gogh wrote to his brother Theo: “ I always saw the thing as impossible and beyond my reach”. But at the end, van Gogh developed artistic skills and a unique style that made him stand out as an artist, and influence modern art. Furthermore, van Gogh worked with existing works to learn about the materials, perspective and get some drawing knowledge in general; and he also developed his skills through interacting and learning from other artists. Thus, from his experience, we can see that art is not an individual process, but is rather an interactive process where learners or artists exchange ideas and techniques, and learn from each other. 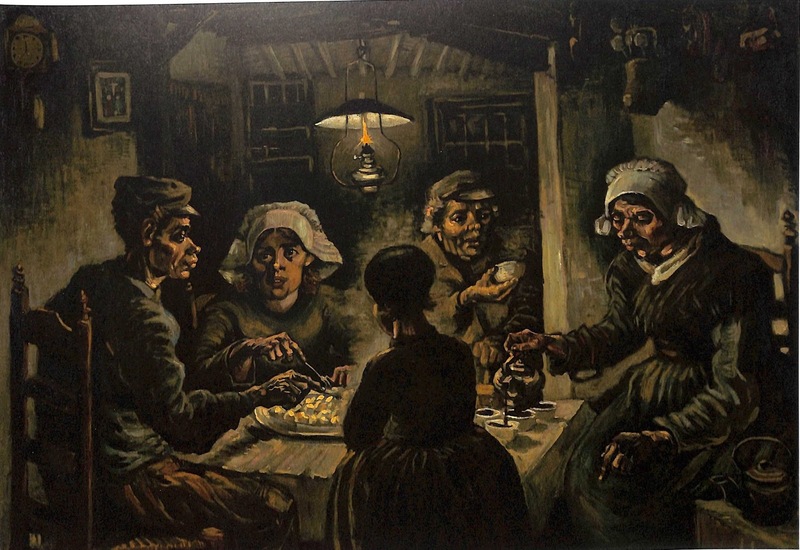 Van Gogh’s first major artwork and one of his most famous ones is the The Potato Eaters. In the image above, we see five people sitting around a table and eating potatoes, under one lamp at the middle. Van Gogh used colors, value and shading effectively in this image to display a somber atmosphere. All the people in the image seem immersed in their actions, whether it is eating, serving tea or talking. 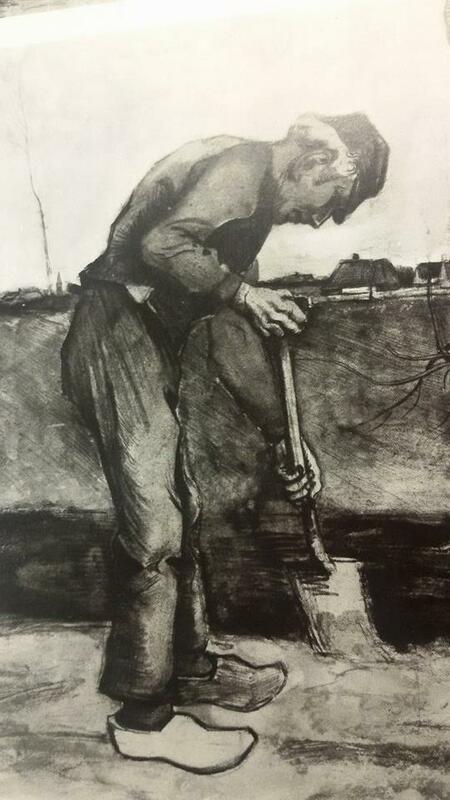 Van Gogh worked on this image when he was living with his parents in the Dutch village of Nuenen, inspired by the “honesty” of the land workers. 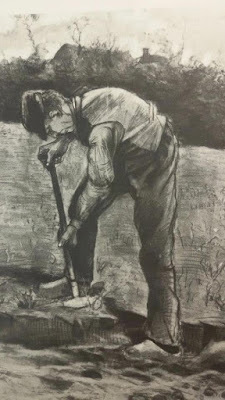 In this context, he said: “these fold, who are eating their potatoes by the light of their little lamp, have tilled the earth themselves with these hands they are putting in the dish, and so it speaks of manual labor, and that they have thus honestly earned their food”. Another artwork where van Gogh conveys the situation of the workers’ families is the following. 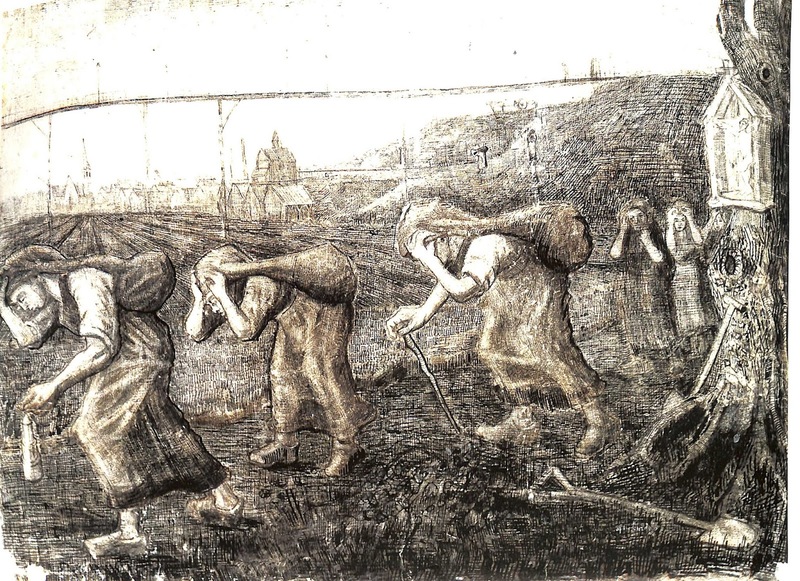 Miners’ Wives Carrying Sacks/ The Bearers of the Burden, Vincent van Gogh, April 1881, Pencil, ink and watercolor on paper 47.5*63cm, Kroller-Muller Museum, Otterlo. 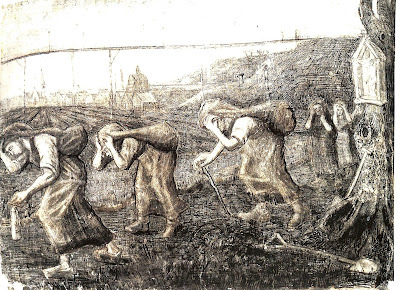 This drawing shows miners’ wives carrying sacks across a bleak land. The women in the image are bent to almost half due to the weight of the sacks, and they seem to be struggling through each step. The countryside is extended and shown in the background, giving space to the image. 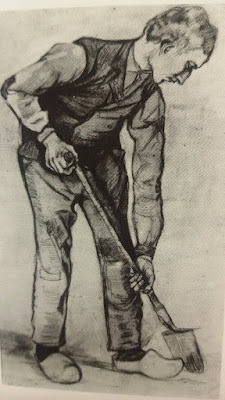 In this drawing, van Gogh used shading and value with black ink and pencil, in such a way that the image is dark, hence offering a picture of the torment and sorrow of the miners’ families, or of a polluted countryside where they work. This drawing is realistic, expressive and emotional. Indeed, through this image among other workers’ images (see additional section), van Gogh tells the narrative of workers’ families, conveys their sufferings and difficult lives, displays human grief and expresses empathy. Van Gogh was concerned with both the sufferings of others and also his own torment. Thus, he also expressed his own torment through self-portraits, one of which is the following. Self-Portraits, Vincent van Gogh, 1887, Pencil, pen and brown ink on wove paper, 31.1*24 cm, Van Gogh Museum, Amsterdam. This image has sketched self-portraits where van Gogh uses strokes of pencil to present an examined frank image of himself. He could have drawn this image from the reflection of a mirror. In these self-portraits, particularly the middle one, it seems like van Gogh pressed and focused on the look in his eyes. In fact, there is an extra eye sketched at the top of the sheet. The eyes, specifically the gaze and the frowning, allow van Gogh to incorporate strong emotions of anger, unhappiness, torment or displeasure into the sketches. I find it interesting how van Gogh could include emotions and imply a narrative through the gaze of the eyes in the self-portraits. 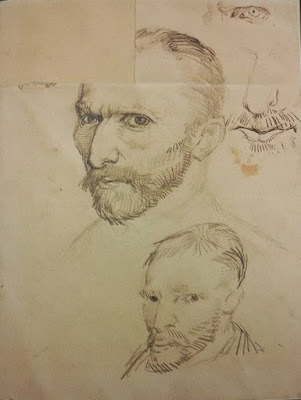 Van Gogh tends, in general, to focus on the eyes when drawing people. In this vein, he said in one of his letters to his brother: “I’d rather paint people’s eyes than cathedrals, for there’s something in the eyes that isn’t in the cathedral… the soul of a person”. All in all, Vincent van Gogh, a self-made artist, did a fascinating job in telling narratives, conveying messages, depicting the reality, and incorporating strong emotions into his artworks with an original style. He overcame his frustrations and mental disturbance to offer the world, within the short amount of time that he lived, some of the greatest and most fascinating artworks in the history of modern art. Roddam George. This is Van Gogh. Illustrations by Slawa Harasymowicz. Laurence King Publishing, 2015. Stolwijk Van Heugten Jansen, Bluhm and Bakker. Vincent’s Choice. Van Gogh’s Musee imaginaire. Vellekoop, Marije. 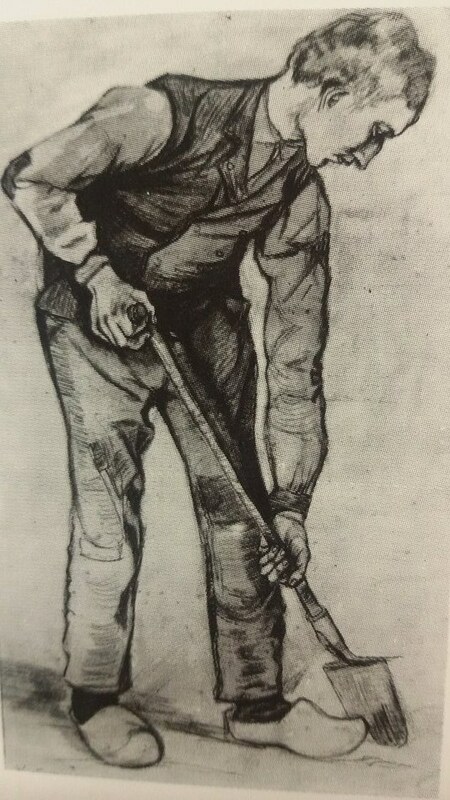 Van Gogh at Work. Mercatorfonds. New Haven, Conn. : Yale University Press, 2013. Wallace, Roberts. The World of Van Gogh 1853-1890. Time-Life Library of Art. New York. 1963.